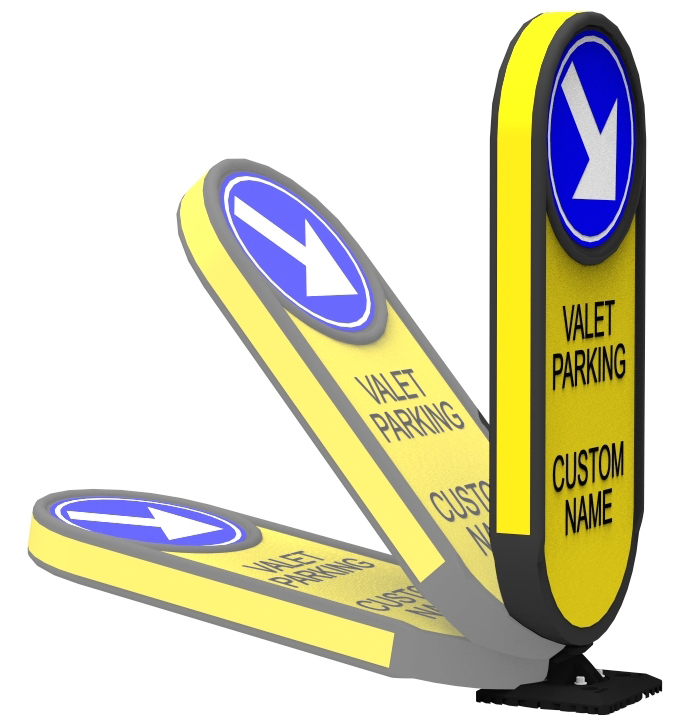 Parking Lot Signs and Directional Signs help you communicate parking and property rules. Well-organized parking lot signs can mean the difference between traffic fluidity and traffic congestion. With Impact Recovery Systems’ full line of parking lot signs and safety systems, vehicles and pedestrians can move through the parking lot quickly, efficiently and most importantly, safely. Light Weight Impactable Aluminum Sign Posts designed to withstand bumper hits and return to original position, without damaging the sign or vehicle. 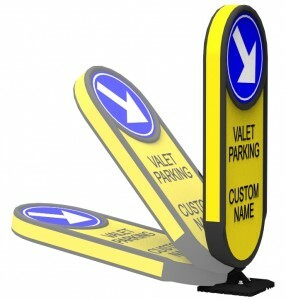 Bollard Enhanced Signs – The addition of a high visibility bollard supplies both enhanced conspicuity, as well as a more formidable visual presence. The SlowStop® Disabled/Handicap Parking Sign system is a revolutionary energy absorbing collision shield that does more than just block access. During a collision, the kinetic energy of the impact is progressively absorbed by an elastomer hidden in the base of this rebounding bollard. The post is able to tilt approximately 20° as it progressively absorbs energy, softening the impact. After the impact, the parking bollard returns upright, leaving your guard intact and ready to perform again. Energy Absorption: 2,667 joules / 1,967 ft.lb. 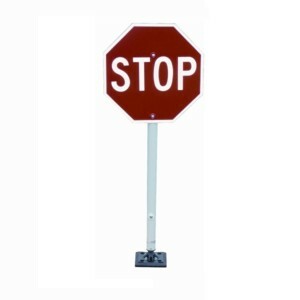 The 5’ Parking Lot Stop Sign was designed for use in parking lots and other areas not covered by statutory requirements. It is a flexible parking sign for areas prone to occasional vehicle impacts. The 5’ Stop Sign comes standard with our patented anti-twist reactive spring system that will ensure the sign will stay in place after impact. 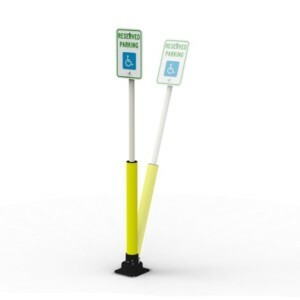 The Flexible Metro Bollard Marker is a strong, blow-molded, single piece bollard that utilizes Impact Recovery Systems’ patented reboundable spring technology. This versatile flex bollard can be customized to display any desired messaging. 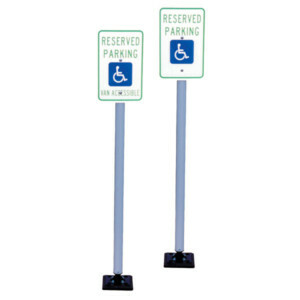 Handicapped Parking Signs are perfect for high traffic parking lot locations and are especially useful for lots without car stops. Much more durable than steel posts, these signs are designed to withstand bumper hits and return to original position, without damaging the sign or vehicle. 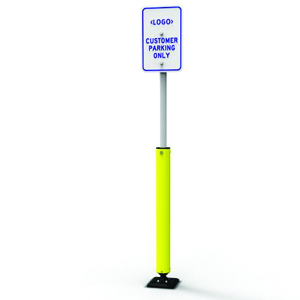 Addition of a high visibility handicap parking bollard supplies both enhanced conspicuity, as well as a more formidable visual presence for each handicap parking sign. This ADA compliant sign (see your local ADA Compliant guidelines for details) utilizes engineer grade sheeting and is available with or without Van Accessible legend.